Singing bass, the lowest range of the voice types, is a deep matter. The bass is the person who sings all the cool low notes in the barbershop quartet. Range: His range is usually F (below the bass clef staff) to E (first line treble clef) but can be as wide as E-flat to F (see illustration below). 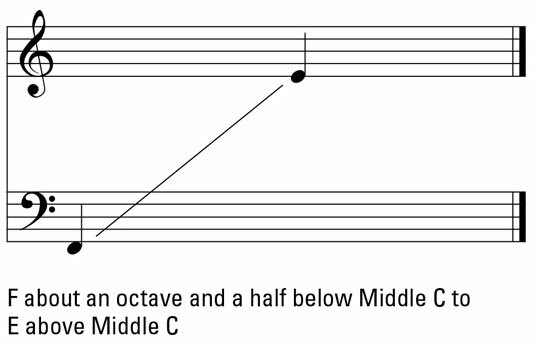 Register transitions: The bass changes from chest voice into middle voice around A or A-flat just below Middle C and changes into head voice around D or D-flat just above Middle C.
Strength: His chest voice is his strength. Voice tone: His voice is the deepest, darkest, and heaviest of the male voices. Weakness: His head voice is his weakness. Subdivisions: Filling in the middle between tenor and bass is the baritone. Baritones are very common. Young tenors often start out as a baritone and then the voice changes. The baritone can usually sing from an A (first space bass clef) to F (first space treble clef) below the male High C.
The bass-baritone has some height of the baritone and some depth of the bass; his range is usually A-flat (first space bass clef) to F (first space treble clef) and sometimes as high as G below the male High C. The baritone’s register transitions usually occur at the B or B-flat just below Middle C and the E or E-flat above Middle C.
Bass subdivisions include the comic bass (funny guy in the show), as well as lyric and dramatic bass. His subdivision buddy, the baritone, also comes in different shapes and sizes: light lyric baritone, full lyric baritone, and bass baritone. Common performance roles: The bass or baritone is often the villain, father, or older man. Examples include Ramfis in Aïda, the Mikado in The Mikado, and Jud Fry in Oklahoma! Some exceptions to this villain image are King Arthur in Camelot, Porgy in Porgy and Bess, and the Toreador in Carmen. Naming Names: Famous basses you may know include José Van Dam, Tennessee Ernie Ford, James Morris, Samuel Ramey, and Barry White. Famous baritones include Trace Adkins, Billy Currington, Jamey Johnson, Brian Stokes Mitchell, John Raitt, George Strait, and Tom Wopat.